As the newly selected police transitions into his role, CNA outlines the ten principles of community policing. Community Policing is a philosophy that promotes organizational strategies, which support the use of partnerships and problem-solving to proactively address the immediate conditions that give rise to public safety issues such as crime and fear of crime. These partnerships are between community members, organizations and the men and women sworn to protect them. Citizens are given a say in the development and support of crime prevention techniques, implemented by them and their community officers. The first principle of community policing includes promotion of the philosophy (way of thinking) and the organizational strategy to implement this way of thinking department-wide. The principle emphasizes the need for strong leadership from the top down in the form of a police chief who can carry out community policing well. In Grand Rapids David Rahinsky began on July 7th as the new police chief. Some of the top hiring criteria were experience and commitment to community policing. The top four candidates were selected based on a chief profile that citizens helped to create last winter. Chief Rahinsky gained experience working in diverse communities while working for the Broward County, Florida sheriff's office for nearly 20 years. In 2006 he was worked as deputy chief and in 2011 as chief of police in Franklin, Tennessee. This experience taught him to value relationships in his community. Citizens should see having a chief who has a good understanding of community policing and a good track record of implementing this strategy in his or her past work experience as important. This includes a history of adopting and implementing creative strategies, in order to motivate strong community involvement. Community members must be part of the community support system and directly invested in the results. Community policing is motivated by the fact that community members and their officers formulate together creative and original strategies to address neighborhood crime concerns. Instead of focusing on individual crime incidents, community policing focuses on coming together to address broader public safety goals that focus not on individual incidences, but many. For example the organization of a Neighborhood Watch with strong access to community officers is known to reduce incidences of burglaries, car larcenies and many quality of life issues. Community Empowerment is principle number two when it comes to community policing. This requires an officer who can educate community members on their power to affect good public safety strategies. City police chiefs set the guidelines for each community officer. In turn the officers are granted the freedom to govern their designated sections of the city. The community members actively have a say in coming up with new ideas to combat crime as a group in these sections. The officer should be effective in a way that the community is willing to support that officer. Officers are no longer following the defined ways of approaching incidence in the community, and are given more power. Power-sharing success was found in the Detroit, Michigan community policing program initiated in 2013 to reduce home burglaries. Residents learning how to identify suspicious behavior and how to report it and police officers connecting with community members played a large part in reducing home burglaries by 25% in northwest Detroit. Detroit Police Chief James Craig has plans to further community policing strategies all over the city. There were 36 neighborhood police officers promoted by Chief James Craig. Overall, community policing engages the community and encourages creative thinking. It supports quality of life and a group effort to reduce crime. 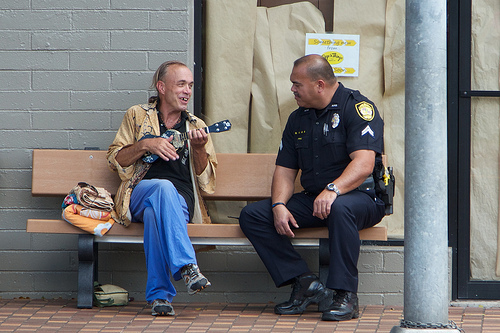 This is the first in a series of articles on community policing. How to grow food successfully: it can't be that hard!